The grocery store that will sell me damn good pizza but cannot deign to provide a soda that wasn’t squeezed from the bark of a tree has decided to offer preferred parking to the owner of hybrid automobiles, presumably to reward them for their contributions to the environment. This, of course, is incredibly stupid, not only because it alienates a large percentage of the customer base, but because the idea that a hybrid is the best and only ecofriendly vehicle that a person can drive is a myth. While a hybrid vehicle may reduce fuel consumption and CO2 emissions, the CO2 costs involved in the manufacture and transportation of a new vehicle can account for as much as 28 percent of the CO2 emissions that will be generated during the life of the vehicle, making the purchase of a used car or the choice to continue driving an older car an equally (if not more) eco-friendly decision. And don't forget that the new hybrids‚ despite lower emissions and better gas mileage‚ actually have a much larger environmental impact in their manufacture, compared to non-hybrids. The batteries that store energy for the drive train are no friend to the environment‚ and having two engines under one hood increases manufacturing emissions. And all-electric vehicles are only emission-free if the outlet providing the juice is connected to a renewable energy source, not a coal-burning power plant, as is more likely. I currently drive a 2003 Subaru Baja. I could have purchased a new car long ago but have opted to continue driving my nine year old vehicle because it’s still doing its job. It’s reliable, fuel efficient and in decent shape. 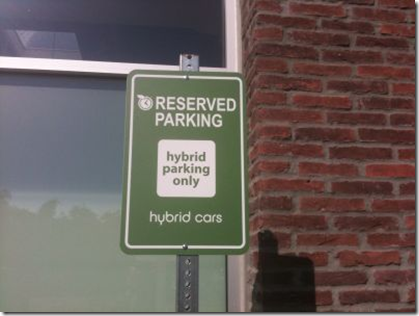 To purchase a hybrid at this point would make no sense in terms of the environment. Yet Whole Foods and other businesses catering to hybrid drivers ignore this scientific reality. I’m guessing that rows of shiny new hybrids abutting their businesses do more to enhance the store’s image than a row of ten year old vehicles.